"A buckle is a great addition to an old shoe"
A buckle card is a delight both to make and to receive. It adds a special pizzazz to a handmade greeting that may be long remembered by the recipient. If you have not tried this cardmaking technique before, why not go ahead and try one now? I'll show you how. First, score your cardstock base into a gate fold card shape and punch a window in the left hand foldover side with your paper punch. I actually used the Modern Label Extra Large punch (retired) from Stampin' Up! in the card shown but you could use the Classic Label Punch or a banner punch, as long as it is going to give you a slot. Even a Big Shot die would work. Now take the smaller piece of cardstock and score it 1cm in on one end. You can finish the other end (the one that will slide into the slot you punched) by rounding the corners with the Detailed Trio punch if you like. Go ahead and slide the smaller piece of cardstock into the punched slot, then align it straight across your card. Adhere the 1cm scored part to the back of your card base. Now go ahead and decorate your card the way you want to. Here I embossed the strap with the Vintage Wallpaper embossing folder (I love that design but it is retired) and used designer paper to create the fan fold flowers and decorate the card fronts with it too. I used the punched shape I created when I made the strap window to stamp a greeting on and popped it up with Stampin' Dimensionals. I used Regal Rose and Marina Mist cardstock (both retired). 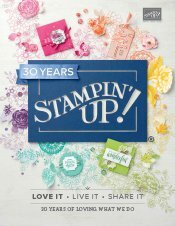 The brad was a Vintage one from Stampin' Up! and the heart for the half flower was made with the small heart punch from Stampin' Up! (retired) and glittered. I added some Sahara Sand paper strips to the opening edges that I finished off with the Scallop Border punch, also retired. I hope you will make a one of these and show me what you have made. If you don't have any of the supplies I used, you can still adapt what you have to make this project your own.